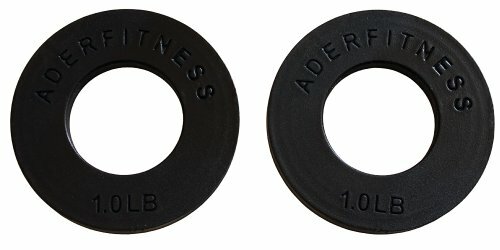 Olympic Fractional Plates Pair- 1 Lb / Each Black by Ader Sports at Cardio Fitness Plus. MPN: OFP-1LB. Hurry! Limited time offer. Offer valid only while supplies last. Micro-load with our Lb fractional plates. Improve your lifting progress with small weight increases to reach the next level and overcome plateaus. Micro-load with our Lb fractional plates. Improve your lifting progress with small weight increases to reach the next level and overcome plateaus. Ship out 2-7 days. Powder-coated solid steel with stamped "Ader Fitness" logo. Designed for a 2" dia. bar. These make a great gift to enhance weightlifting workouts at all training levels! If you have any questions about this product by Ader Sports, contact us by completing and submitting the form below. If you are looking for a specif part number, please include it with your message.